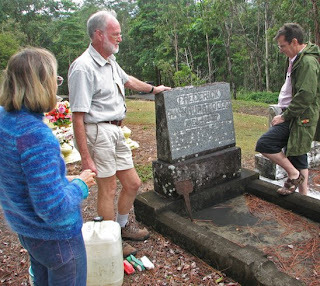 During a recent visit to Far North Queensland, Dr Geoff Monteith suggested a clean-up of the Dodd gravesite in Kuranda was in order. 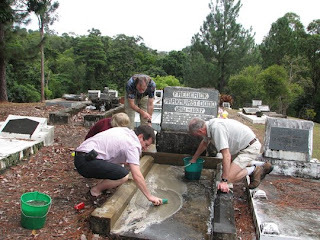 On Friday 23 May a small group of entomologists assembled at lunch in the Kuranda Cemetery on the Kennedy Highway to clean the headstone and reminisce about the life and times of the Butterfly Man of Kuranda. The Group. From left to right Geoff Monteith, Max Moulds, Paul Zborowski, Kerry Huxham, David Rentz (in back), Margaret Humphrey, Geoff Thompson. (Photographer Caroline Fewtell). 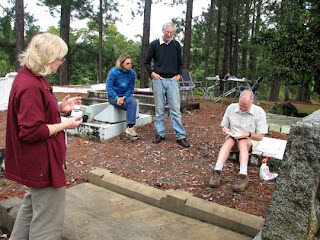 Following the cleaning, Geoff Monteith read the complete poem of Longfellow quote on the headstone from the very book that Dodd owned. A detailed account of the life of F. P. Dodd and his relatives is beautifully presented in a 34-page booklet written by Geoff Monteith available from the Queensland Museum (see below). This should be consulted by anyone interested in following up on the life of this interesting person. Much of the information presented here is drawn from this source. This is only a brief account of what is available in the book noted above. 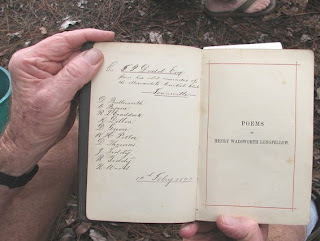 Frederick Parkhurst Dodd was born on 11 March 1861 in Wickliffe, Vic. 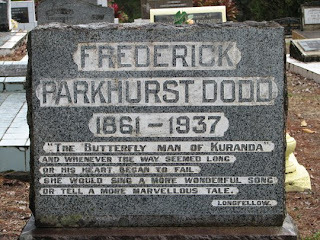 and died in Kuranda on 27 July 1937, aged 76. He started his working life as a banker in Charters Towers, Qld and at the age of 34 made a “sea--change”, quit his job at the bank to collect insects! The family moved to rural Queensland and at the age of 43 eventually settled in Kuranda. At the time he had three children and a wife to support. In brief he became a professional insect collector and supplied professionals and amateurs alike with the fruits of his efforts. His home became a tourist attraction. His children, Colin, Elizabeth and Katherine became doorkeepers and assistant guides on busy days. 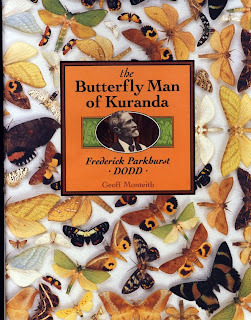 He made specialty collections, mostly of moths, which are the most colourful insects around Kuranda with probably more than 2000 species at any one locality alone. Members of the Dodd family. Daughters Kate and Elizabeth standing, Frederick and Jane seated. The had four sons, Walter, Frederick, Colin and Alan. Descendant live today in the Atherton-Cairns area. Dodd's garden where he raised many plants he used to rear his moths. The site is across the street from the present day post office. Where's the rainforest? Youngest daughter Katherine with a giant Kauri log so large that it could not be moved by train to Cairns because it would not fit through the tunnels! This would be quite a tourist attraction had it been left growing where it was found. The Kuranda State School circa 1904. Note how different the place looks from what it does today. Not much rainforest then. Dodd took his collection “on tour”” around eastern Australia, often accompanied by one of his children to help in setting up the displays in halls. There must have been tedious and the amount of careful packing a very time-consuming activity as the cases had to be taken overland and by sea. His arrangement of specimens was considered as “unscientific” by professional entomologists but his point was not to pander to them. He was trying to attract the interest of the average person and so once he gained their attention by his displays he could then relate the discoveries he had made. And he made many important observations on the life histories of many common and obscure species. Probably this interest in the life history of insects is what lead one of his sons, Alan, to become a professional entomologist. At the age of 17 he published 4 papers and eventually named 478 species in the wasp family Scelionidae alone! 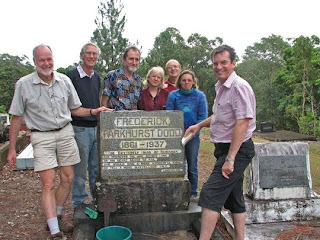 He was instrumental in the success of the Prickly Pear project in bringing the Cactoblastis moth to Australia from Argentina and was awarded the MBE and OBE for this. The Alan Dodd Tropical Weeds Research Centre in Charters Towers, Qld was named in his honour. He died in 1981. The "Poem Case". This display gives a verse from the Longfellow poem composed to honour the 50th birthday of the American biologist Alexander Agassiz. The words are spellout in tiny yellow pyalid moths and the signature in green beetles, common around Kuranda. (From Monteith, 1991). Many of Dodd senior’s species were new and were described by overseas entomologists with the important “types’ being placed in foreign museums like the British Museum (now the Natural History Museum, London). This practice came to infuriate Australian entomologists because whenever they had to check a species against the type, they usually had to deal with overseas museums many of which were reluctant to trust the fragile insects to the post what with wars and the great distance to Australia. This meant that Australian entomologists (yours truly included) had to traipse around Europe (to a lesser extent America) on expensive (but enjoyable) “type trips” to view and compare types with newfound examples. Incidentally, this was one of the reasons for the founding of the Australian National Insect Collection, Canberra, a part of CSIRO Entomology. Such a properly funded facility would accommodate leading entomologists ho would document the Australian fauna and place the type specimens of their new species in an Australian collection. Laws were passed to make it legally binding for both Australians and visitors alike to deposit type specimens of new species in Australian collections. These draconian measures were not widely accepted in the entomological world with both Australians and foreigners feeling that this was a bit heavy-handed. But the law still stands. If anyone wants to export insects from Australia a permit is required. Any new species resulting from such collections must be deposited in an Australian collection. As a commercial collector, Dodd would be greatly inhibited in his activities today by these laws. He may not have coped. He seemed to have a short fuse and may have gotten into conflict with the law as it stands today. Who knows? The Pollen and Nectar-feeding katydids (Tettigoniidae; Zaprochilinae) are represented by four genera comprising some 17 species. 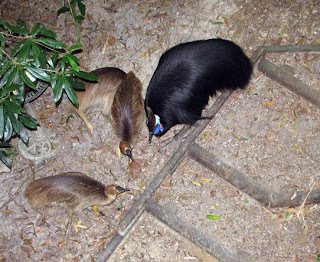 The entire group is endemic to Australia and all species are nocturnal. 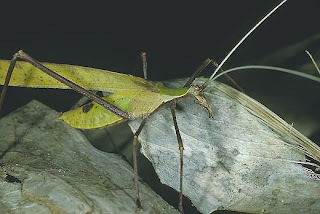 They appear to be related to the Australian Stick Katydids (subfamily Phasmodinae), a group known only from heath habitats in coastal south and west Western Australia. These are katydids that are easily recognisable and often very common. Both groups have specialised mouthparts suited for dealing with a range of flowers. The Stick Katydids eat both pollen and the flowers themselves, whereas, the Pollen and Nectar Feeding Katydids seem to deal only with pollen and nectar, leaving the remaining floral bits untouched. It is the latter group that we will deal with here. Fig. 1. Male Anthophiloptera dryas Rentz and Clyne. Note protruding mouthparts. The four genera comprising the zaprochilines are distributed widely across Australia; however, no Pollen and Nectar Feeding species have been recorded from the Northern Territory. The most recent review of the group was by myself, Rentz (1993). One species. The Balsam Beast, Anthophiloptera dryas Rentz and Clyne, was the only species known at the time from far north Queensland. It has an extraordinary range for a katydid, extending from Cairns south to Batemans Bay, NSW. It occurs in coastal rainforests and was first discovered by Densey Clyne in her garden when she lived in Turramurra, a suburb of Sydney. She documented its incredible life history and recorded it in a number of her books, for example see Clyne (1982). It was a pleasant discovery to find it in our rainforest patch in Kuranda, more than 2000 km from our coastal forest at our home in Bawley Point, NSW where we also found it. Fig. 2. Male A. dryas. Note the shape of the wings and the angle at which they are to the body. A. dryas is the largest known member of the Pollen and Nectar-feeding Katydid subfamily with females measuring as much as 35 mm in body length, with the tegmina added it almost doubles that length. These insects are the most “prognathous” of the group with the head lengthened to facilitate feeding deep into flowers. They feed on a wide range of pollen and nectar. Eggs are laid in cracks in the bark of trees, presumably near a reliable food source. 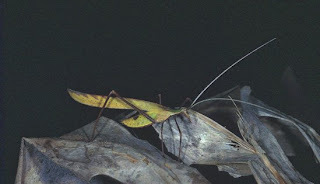 Nymphs have a peculiar resting posture that has not been observed in any other katydid groups (see below). As they grow, they change their shape and become more brown and cryptic, resembling twigs and stems. Females always have 2 spots on the top of the abdomen. The adults sit in a characteristic position during the day, motionless with less outstretched with their ventral surface tightly in contact with the substrate and the forelegs and antennae outstretched and parallel in front. The tegmina are held at 30O from the body surface as in Zaprochilus and Windbalea, which are noted below. The Green Flower-feeding Katydids, Windbalea spp., are beautiful katydids known from only a few localities along the south coast of southwestern Western Australia. At first glance they resemble the green katydids of the genus Polichne but the resemblance to Anthophiloptera species is apparent when closely examined. These katydids eat both pollen and nectar as well as other floral parts. They are locally abundant and very important relics in a disappearing habitat that is uniquely Australia. Fig. 2. Windbalea viride Rentz, a Green Flower-feeding katydid from the Esperance region of Western Australia. 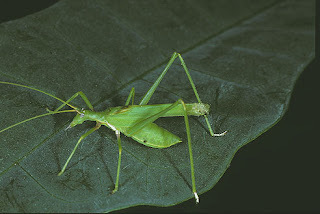 The Small Flower-feeding Katydids were largely unknown because they are small, the males short-winged, females wingless and they occur as adults during the winter and early spring. One genus, Kawanaphilus, is known comprising some 11 species. They are active at night even when temperatures are in single figures. By the time the warmer temperatures return, they are largely gone. 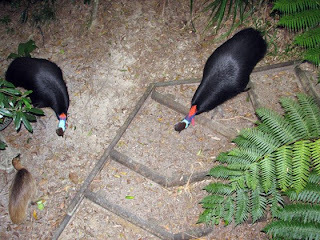 They are present in heath habitats in the southern part of Australia in heath habitats on both sides of the continent. The ease with which they can be obtained and kept in the laboratory has lead them to be important laboratory animals at the University of Western Australia where resident zoologists, visitors and students have studied them intensively. They have been important players in studies of sexual selection in insects involving mate preferences, intermale competition and their controlling factors. See Gwynne & Simmons (1990), for example. One species has appeared on the cover of Nature (1990, vol. 346, number 6280). Eleven species have been described to date. The hairy body of Kawanaphila species suggests that they may be involved with pollination as tiny pollen grains adhere to the hairs and can easily be moved from flower to flower. Fig. 3. A Small Flower-feeding Katydid, Kawanaphila iyouta Rentz from Western Australia. This is a female. Note the short ovipositor. The Pollen and Nectar-feeding Katydids of the genus Zaprochilus are very characteristic and widespread. Four species are known. Three are long-winged and capable of flight, the other is a short-winged species from a single locality in an arid portion of Western Australia north of Perth. The long-winded species have the wings held at a distinctive angle with the body. In addition, the outer wings (tegmina) seem to be rolled or cylindrical. This and the mottled greyish colour serves in twig mimicry. Fig. 4. A male Zaprochilus australis. 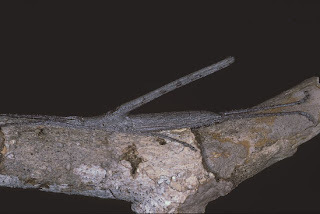 Note characteristic resting position and the "rolled" subcylindrical wings. 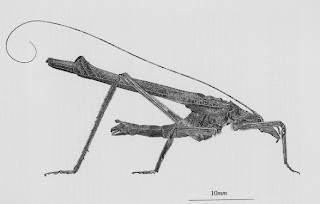 As an aside that might be of interest, Zaprochilus australis (Brullé) is one of the earliest described species of Australian Orthoptera. The first specimen was collected on an expedition authorised by Napoleon Bonaparte that comprised two vessels, one, Le Géographe the other Le Naturaliste. The former ship was captained by Capt. Nicholas Baudin, the purported collector of the type of the species on Kangaroo Island, South Australia in 1802 or, perhaps, in 1803 when another ship, the Casuarina returned there. This species is the most widespread of the genus and occurs across the southern end of the continent and seems quite abundant at times. One species of Zaprochilus has been found in Kuranda. Z. mongabarra Rentz, is known from northern New South Wales, the Brisbane area of Queensland and they hundreds of kilometres to the north around the Mt Windsor Tableland and the Cairns vicinity. It does not seem to be as common as Z. australis and seems to be more arboreal than that species. 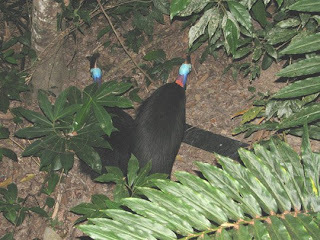 Males can be heard stridulating with a Mini Bat Detector after dark from high in rainforest trees. Fig. 5. Adult male Zaprochilus mongabarra Rentz. Note tip of abdomen. The structures are important identification features. Fig. 6. Scanning electron micrograph of the tip of the abdomen of a male Z. mongabarra. Fig. 7. 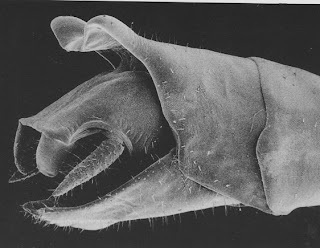 Scanning electron micrograph of the stridulatory file of a male of Z. mongabarra. This structure is located on the underside of the left wing (tegmen). Each species has a characteristic file- in length, shape and number of teeth. When this is struck against a raised vein on the opposite tegmen, a sound is produced. The physiology of the species and the features of the tegmen along with the file produces a sound that is species distinctive. Males sing to attract females. Clyne, D. 1982. Wildlife in the Suburbs. Oxford University Press, Pp-1-201. Gwynne, D. T., Simmons, 1990. Experimental reversal of courtship roles in an insect. Nature, 346: 172-174. Rentz, D. C. F. 1993. A Monograph of the Tettigoniidae of Australia. Volume 2. The Austrosaginae, Zaprochilinae and Phasmodinae. Pp 1-386. CSIRO Information Services, East Melbourne, Victoria Australia. 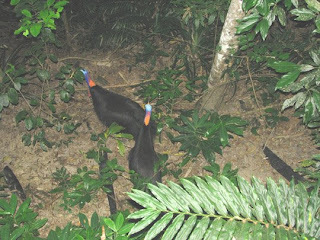 Male and female Cassowary and chicks. The female is the larger of the two adult birds. Male stroking female with left leg. 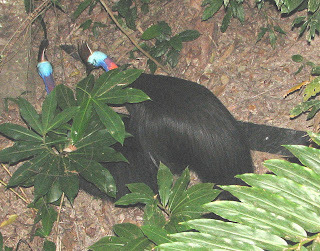 Male mounted on female Cassowary. Little has changed since the last report but read on there are some dramatic observations. There seems to little growth on the part of the chicks. They are still “squeaking” and whistling loudly when they are separated from their father. It is the Dry Season now and there is not much on the ground for the birds to eat. This may explain the lack of growth in the chick in the past month or so. The female, probably their mother, has been accompanying the father and the chicks on most mornings. She is usually in the background and approaches silently with neck outstretched making her look much taller than the male. 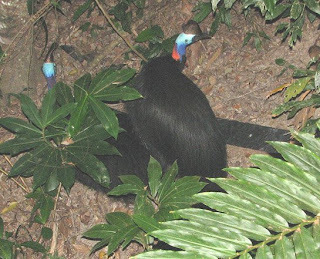 This is important as size matters with Cassowaries and the female is the dominant member in Cassowary societies. What is interesting is that she accompanies and feeds with the young. They are slightly intimidated and don’t get too close. The male utters grunts and low hisses when she is around and never looks her in the eye. His head is always down and could be described as “submissive”. This is most unusual if you read the literature. Females are supposed to be aggressive towards males and chicks. But read on and you’ll see that she has a motive. On the morning of 1 May 7.30 am) the female approached the feeding male and chicks but sat down on the ground some metres away from the trio. Her head was positioned horizontally, almost touching the ground. The male moved away from the chicks and attempted to mount. He moved from side to side and then began stroking the female with his left foot, gently, just above the base of the tail. This went on for some 10 minutes while he was on her back. I saw no evidence of copulation. They were silent during this time. The chicks remained in the area and came over from time to time to observe what was going on all the while making low squeaking sounds. After 15-20 minutes the pair separated and the female moved away out of sight. I was reluctant to follow them down the hill as they may allow the bubs to observe, but might not like my presence. Perhaps, the female’s accompaniment of the trio has to do with her reproductive state. The male will probably ditch the young in August, we’ll see, and then he “disappears” for several months, eventually showing up with the chicks around November. At this stage, with the chicks not nearly grown enough to fend for themselves, he cannot consider sitting on eggs for 50 days or so. The female is probably visiting several males and will breed with one who is not encumbered with chicks or nearing the end of his fostering of the young.